Roses have been a part of American history for hundreds of years, having made their debut in the 16th century. The beauty, fragrance and characteristic differences in rose varieties make them a favorite. There are many different types of rose bushes to choose from. Floribunda rose bushes are the most colorful of all types of roses. Cultivars include Day Breaker, Honey Perfume and Betty Boop. These roses generously produce colorful, fragrant clusters of up to 15 blossoms per stem. The blossoms vary in size and can be over 3 inches in diameter. Blossoms can be single or double. The bushes themselves can grow to be 18 inches to 3 feet tall with bushy foliage. Floribunda rose bushes are most popular because they bloom abundantly from spring until fall. Plant them in a sunny spot and mulch around the canes to protect the roots. The rose bush will begin to flower about three years after planting. Hybrid tea rose bushes are one of the most popular types of roses. These types are commonly chosen among florists for cut flowers. Ambassador, Blue Girl and Gypsy are all hybrid tea roses. They produce one brightly colored blossom per stem, and the blossoms are often highly scented. Hybrid Tea rose bushes can grow to be 6 feet tall and can produce flowers throughout the entire growing season. Much like Floribunda rose bushes, plant Hybrid Teas in a sunny spot in well-drained soil. Water every week to 10 days, and avoid getting the foliage wet. Wet foliage can attract pests and cause disease. The smallest of all rose bushes, miniature roses are very popular container plants. They also grow well when planted directly in the ground, the same as other types of rose bushes. Child’s Play and Sun Sprinkles are miniature rose varieties. These rose bushes produce flowers continuously throughout the growing season and can grow to be 2 feet tall. Plant these rose bushes in well-drained soil, water them regularly, and fertilize them once a month. Miniature rose bushes that are grown in containers will need to be repotted every few months. 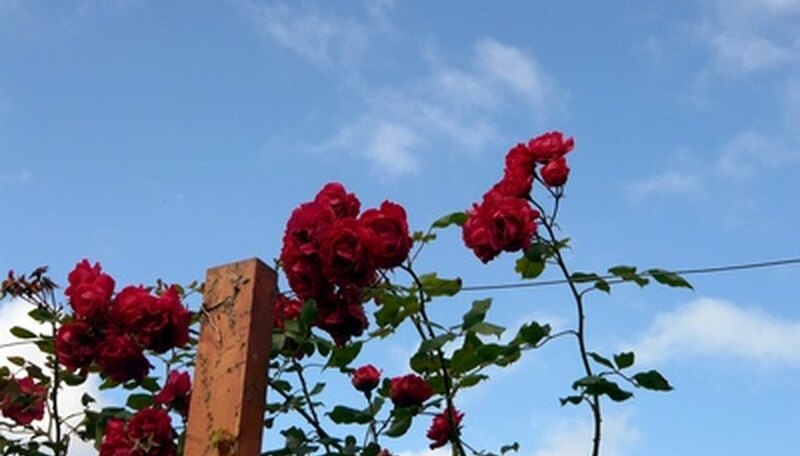 Climbing rose bushes are those typically grown on trellises. Pink Promise and Cinco de Mayo are climbing roses. Their canes are long and capable of climbing almost any structure including fences and walls. The strong, thick canes can grow to be 6 feet or longer in length. They can spread up to 20 feet and bloom with colorful, fragrant roses. Plant them in a 2-feet-deep hole that is twice as wide as the root spread. Compost around the base and water the plant thoroughly. Fertilize and then mulch over the compost. The bush will begin to bloom after a couple of years.